What Is Trump’s Mental Age? TBH, I'm not sure you can even call it satire anymore! Can you really tell the difference between SNL and "President T"
"And Then I'll immediately be sued… And Then I'll Call My Buddy Kavanaugh…. He'll say new phone who Dis"
Thank you, Mr. President, for making me aware of that show! As you requested, I looked into it. Great Job. As you recognized, it's a "total Republican hit job". That collusion between Republicans and NBC could explain why the gap between parody and reality seems to be so small. Great unity in the Republican Party. Want to, once and for all, put an end to stoppable crime and drugs! Border Security and Wall. No doubt! ["BUILD A WALL & CRIME WILL FALL!" ,"BUILD A WALL & CRIME WILL FALL!" ,"I am a stable genius!" Interpretation: “BUILD A WALL & CRIME WILL FALL!” and “I am a stable genius!” are true, because both assertions appeared at least three times. Actually, “BUILD A WALL & CRIME WILL FALL!” is double-plus-true, because all letters have been capitalized and because the assertion ends with an exclamation mark. Author Goetz KlugePosted on 2019-01-25 2019-02-16 Tags agenda setting, crime, Haskell, it's not about the wall, mnemonic, stable genius, The Bellman's Rule, Trump, Trump traits, wall, What I tell you three times is true! 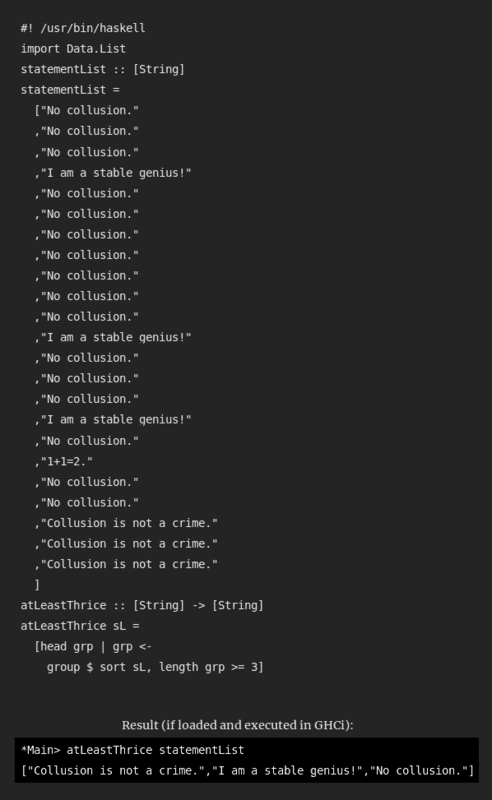 ,"Collusion is not a crime." Author Goetz KlugePosted on 2018-07-27 2019-02-16 Tags collusion, golf, inspired by Lewis Carroll, stable genius, The Bellman's Rule, The Hunting of the Snark, Trump, What I tell you three times is true!